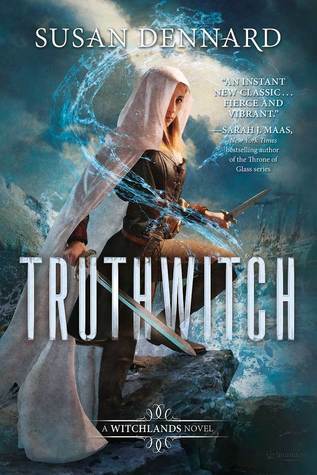 Book Review: Truthwitch by Susan Dennard | A Book. A Thought. 18 July, 2017 18 July, 2017 / Sofii @ A Book. A Thought. It’s so difficult to choose where to start talking, I’ll try to be as brief and orderly as possible to be clear, I really wanted to like this book , REALLY, I’ve seen many incredible reviews about it, in fact in Goodreads is full of them, which is why I believe that I’m the only person who has had problems with it and that makes me feel super bad! I want to be clear before continuing: My review is not meant to offend anyone neither those who love the book or her author. Yes! Baeduan definitely makes the series better!! I’m always amazed how each year I find new favorite authors, and others fall to the wayside. I love the change – it makes each year more interesting. I made it to page 56, or something, and stopped reading. I honestly don’t know if I’ll ever pick it back up. You’re not alone. I felt very confused and out of place in the brief bit I did read. I also thought the writing wasn’t planned beey well and felt sort of scrambled about. I rather enjoyed the book, but perhaps I understood it more because I get Susan Dennard’s newsletter and so I got to read about her writing process with the book and the worldbuilding and the types of witcheries and such. Plus, she released a video where she pronounced all the main characters’ names, which was really helpful. But I completely understand all of your points. As a huge fantasy fan myself, I wanted a bit more about the development of the world and the conflict and the witcheries. I feel like this is explored a bit more in the sequel, Windwitch (which yes, does feature more Aeduan so there’s that). I have only read Something Strange and Deadly, the first of her debut trilogy, and I enjoyed it despite the fact that I’m not normally someone who likes books or anything with zombies, so maybe that is something you might enjoy more. And the really cool part is that with Something Strange and Deadly, they just rereleased them with new covers and I love the redesign. I definitely need to get physical copies of the whole trilogy so I can stare at them. Have a great day, Sofii. Although in truth I still don’t know exactly what the ever loving f is actually going on … ? I enjoyed the individual storylines in Windwitch (Truthwitch too but less so) but I’m still confused by the bigger story/plot here because like you said … there is not enough explanation and foundation. I haven’t read that one yet . I don’t know if I’m going to read it or not , now . Any book that I just don’t understand hits my DNF list real fast . I recently just finished reading book 1 of Susan Dennard’s other series “Something Strange and Deadly.” I was unimpressed with it. Like it was okay, but not great. I was debating picking this one up, but I may pass on it now that I’ve seen your review. I really dislike it when fantasy novels don’t explain things enough. It makes it hard to connect to the characters if you can’t understand their world. I feel like sometimes YA authors try too hard to make their world seem complex and deep by thrusting the reader into a setting full of confusing words and names just for the sake of seeming very “high fantasy’, which is immensely frustrating! Again, very well written and awesome review! I agree with you that sometimes a simpler world is better as it may be easier for the reader to envision it and immerse themselves in it! And I actually own “Truthwitch” so I may give it a chance, because like you said, I want to give the author another chance! If you do read “Something Strange and Deadly”, I will definitely look forward to your review and hearing what you think of it! I pretty much had the exact same thoughts about this book. It was sadly not as good as I thought it’d be and I really needed a glossary to keep track of everything. I also tried this book, but just couldn’t connect and lost interest. I loved this book! I’m sorry it didn’t worked out for you. This book is very hard to get into so I pretty much understand your issue. I was interested in this one. So now instead of purchasing it I think I’ll get it from my library and try it out. Bummer that this didn’t work out for you! You’re not the first I’ve read a mixed review about this series from though. I’ve owned this book since like January and keep putting it off haha. Maybe one day I’ll muster up the willpower to carve my way through it and see what I make of it too. Oh I’m so sorry you didn’t enjoy this one 😦 I really am hoping I’ll have a different experience but yeah, we can’t always expect the hype to be right (for everyone, anyway). Great review! Pingback: My Most Disappointing Books of the Year  | A Book. A Thought.